Ole Gunnar Solskjaer will not want to change a great deal about his starting lineup for Manchester United’s meeting with Brighton and Hove Albion on Saturday. 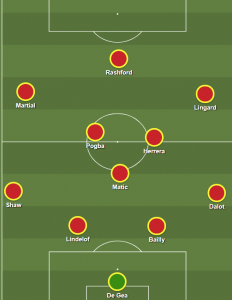 The team which started and won against Tottenham Hotspur played with maturity and aggression throughout, underlining how Solskjaer, in less than a month, has already found his best XI – something Jose Mourinho never really managed in two and a half years. That said, Solskjaer will want to rotate a couple of players to give other players a chance to impress in front of a buoyant Old Trafford crowd. And with that in mind, here is how Man United are likely to line up for the meeting with Chris Hughton’s team. Eric Bailly returns from his three-game suspension and, following a somewhat stilted performance from Phil Jones at Wembley, deserves a chance to show what he can do alongside Victor Lindelof. You can only hope the man doesn’t try to kill somebody with a challenge and get sent off. Another player who needs minutes is Diogo Dalot. Still finding his feet at Old Trafford, the youngster ought to be eased in through careful rotation with the established Ashley Young, depending on the nature of the game at hand. This one feels perfect for Dalot.